Location : Riga is the biggest hotel complex on the territory of the city of Russe. 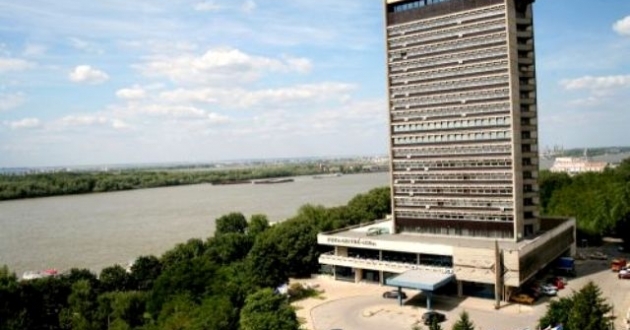 it is situated on the very riverside of the Danube, in the neighbourhood of many state institutions, banks and culture centres. Accommodation : 73 double and 27 single with TV sets and cable television system, telephone, mini-bar, sanitary center with bath-tub and the respective consumer goods; The standars suites are 5 and the VIP rooms are 14. Food : Restaurant Panorama, basic restaurant, Viennese confectionary, tavern in traditionale bulgarian style, night club, lobby bar. Sports and facilities : Fitness room, sauna, massage studio, solarium, shops, Internet access, own washing sector, safety deposit box, video – control, clothing store, conference halls with 120, 70, 40 and 25 seats, underground and open-air parking, technical equipment for the conference halls.